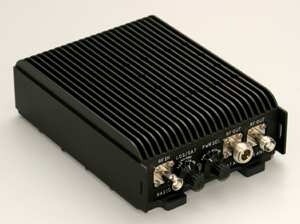 Bothell, WA -- AR Modular RF recently announced the completion of a new 50-watt auto-tuning, multi-band tactical booster amplifier, designed to make it easy for troops to maintain constant, reliable communications in even the worst environments. The new AR-50 booster amplifier boosts tactical radio signals from handheld and back-pack transceivers operating in the 30 – 512 MHz band. It provides 50 watts output with as little as 2 watts input and offers two antenna ports dedicated to line-of-sight (LOS) or UHF Satellite (SATCOM). The system also provides a switchable low-noise amplifier (LNA) and a three-position RF output level control. The small, compact, lightweight unit can run from either 12v or 24v vehicle power systems. AR Modular RF has received its initial order for model AR-50 Booster Amplifiers, and units will begin being shipped shortly.